It can be debated that the struggles this season of perennial contender New Jersey Devils, may be, or may not be a result of their insistence on retaining star winger Ilya Kovalchuk this summer. What cannot be debated, is that his contract saga cost them dearly, and it has wreaked havoc upon their cap situation. Following the 2007/08 season, the Devil's division rival Pittsburgh was in a very similar situation. At the deadline, they had pulled the trigger on a trade with Atlanta which netted them a high powered, pending UFA winger in the form of Marian Hossa. After an iffy start with the Penguins, Hossa and Pittsburgh really seemed to click during the team's run to the Final. Although they came up short of winning it all, Hossa's playoff performance made it a near necessity to re-sign him, as GM Ray Shero believed he had finally found the perfect winger to play with Sidney Crosby. Yet, at the time, the Penguins had other worries. In addition to Hossa, Stanley Cup Final roster players Brooks Orpik, Ryan Malone, Pascal Dupuis, Jarkko Ruutu, Georges Laraque, Adam Hall, Ty Conklin and Gary Roberts were all pending UFAs, and goaltender Marc-Andre Fleury was a pending RFA. Also looming, was the reality that in the upcoming season, star centers Evgeni Malkin and Jordan Staal were entering into their contract years. We all know what happened. Hossa rejected the Penguins 7-year, $50 million offer to accept a one-year deal with Detroit. "I want to have the best chance to win the Stanley Cup," said Hossa, who was acquired by the Penguins in a Feb. 26 trade with Atlanta. "When you look at all the teams I could choose from, at the top there were two teams ... at the end of the day I felt like I would have a better chance to win the Cup with Detroit." With his departure and subsequent statement, Hossa was branded a traitor in Pittsburgh, and became persona non grata. 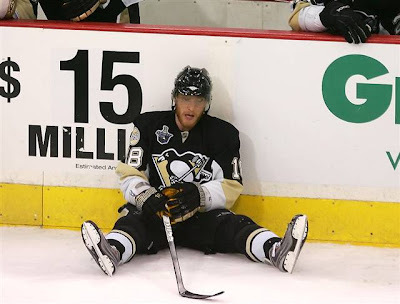 In the end, the scalded Penguins fan felt avenged when the team defeated Hossa and the Wings in the Final that season. The Hossa saga was over. ...but what if Hossa had made every Pittsburgh fan happy by accepting the Penguins offer? What differences would it have created for the franchise? From a financial perspective, even without re-signing Hossa, the Penguins were forced to say goodbye to Malone, Roberts, Ruutu, Laraque and Conklin, so we would have to assume that there would have been no change there. Despite worries of exaggerated salary demands and rumors of having to trade him away, the team agreed to an extension with Evgeni Malkin in July 2008. As structured, his new contract would not kick in until the following season. Marc-André Fleury was also signed to a long term extension. With the finish he had in the regular season and his outstanding performance in the playoffs, it is reasonable to assume that Hossa's signing would not have impacted Fluery's contract terms at all. Additionally, bruising defenseman Brooks Orpik also declined other offers to return long term to Pittsburgh. Hossa's signing would seemingly not affected Pittsburgh's other key moves. So where does that leave us? For the 2008-'09 season, the $7.14 million cap hit that would have gone toward paying Hossa, most likely would have prevented the signings of Miroslav Satan, Ruslan Fedotenko and Matt Cooke. Collectively, that group of free agents counted $7.20 million against the cap. The team still most likely would have made the move to unload defenseman Ryan Whitney later that year; but would it have been a trade to add Chris Kunitz and prospect Eric Tangradi with Hossa playing on Crosby's flank? They still could have made the trade for Guerin who's leadership, many say, made a difference for the team in the post season. The financials would have all worked. The big question? Would they still have won the Cup? Making assumptions regarding the team's performance is a whole other game. Yet, without Kunitz, who makes the nifty outlet pass to spring Max Talbot for the Cup clinching goal in Game 7 of the Final? ... just asking. However, it is after the '08-'09 season that things would have become dicey. In the summer of 2009 the Penguins had no choice but to watch their shutdown defensive pairing go. Rob Scuderi to the Kings and hulking Hal Gill to Montreal. Malkin's new contract kicked in and Jordan Staal agreed to an extension that levied a $4.0 million cap hit. The team added a handful of low cost role players as they had little wiggle room under the cap. With Hossa's $7 million + on the books, would the re-signing of Staal have be feasible? Would they have found themselves in the same situation as the Devils have this season? By keeping Hossa would they be forced to let go of Staal? Would they have achieved the same level of success not having enjoyed the services of an elite agitator in Matt Cooke, or the physical presence and defensive responsibility of Chris Kunitz? Would the Penguins indeed have been forced to trade away Evgeni Malkin? Would they have ever witnessed Fleury making the "Secret Service Save" to win the franchises third Stanley Cup? Yet, in light of what Kovalchuk has done to New Jersey's cap options, and subsequently, the ramifications it has had on their performance thus far; Marian Hossa may have done the Pittsburgh Penguins the greatest favor in team history by turning them down.